I can't seem to find anything close to information about this. Using Roman iron/ steel, and roman armor (lorica segmentata plates OR the breast plate they used). Thrusting/ stabbing using a spear. Which spear head design would be best at piercing the plate and actually damaging the person beneath? 1. (Close to) Flat, quick to be semi-broad edge. The initial impact punches through the armor and then let the rest of the blade freely glide through. It has little tapering in the midrib (but enough so that it wont bend). This video shows nr 1 in action. (altough it's too thick). 2. (Close to) Flat, slow to widen. This blade tapers more slowly and so disperse the energy more throughout the actual cut of the piercing. It has little tapering in the midrib (but enough so that it wont bend). It cuts less, and puts strain in all directions. It probably can't be flat, because of the limitations of the metal. Using the metal at the time, how much would they pierce it? And again, all these may be completely wrong.. The plates of lorica segmentata armor were soft iron inside and (some at least) were mild steel on the outside, about 1mm. I think the last would be the best. Flat and broad = flexible, Usually and also aren't the best for thrusting through heavy clothing, let alone iron. Thank you. Let's imagine it's not so flat that it would bend easily. Thick enough so it would stand the impact. It would have to be either very thick and heavy or triangular, which would also make it heavy and hard to produce in ancient times. The shape of the tip and breadth of the blade is still not good for hard penetration anyways. It is very broad and if not very slender will have a hard time going past the initial punch. I suspect something a bit like the roman Pilum head would work best .Small, pyramidal heads..max force concentrated on a small area. Sort of similar to the classic bodkin headed arrow or medieval times. . There is also the goedendag. The ideal shape for penetrating plate is as narrow a spike as possible but, in order to stop it deforming when impacting the surface, it needs to be as hard and stiff as possible. The two factors are mutually exclusive because you more you reinforce the point to prevent deformation, the more you increase its surface area, which diminishes its capacity to penetrate. Historically there was no such thing as a sword designed to penetrate plate because it wasn't possible for a human to generate enough energy to do it. For the entire three thousand year history of body armour, fighters were trained to aim for targets that were not protected by plate. 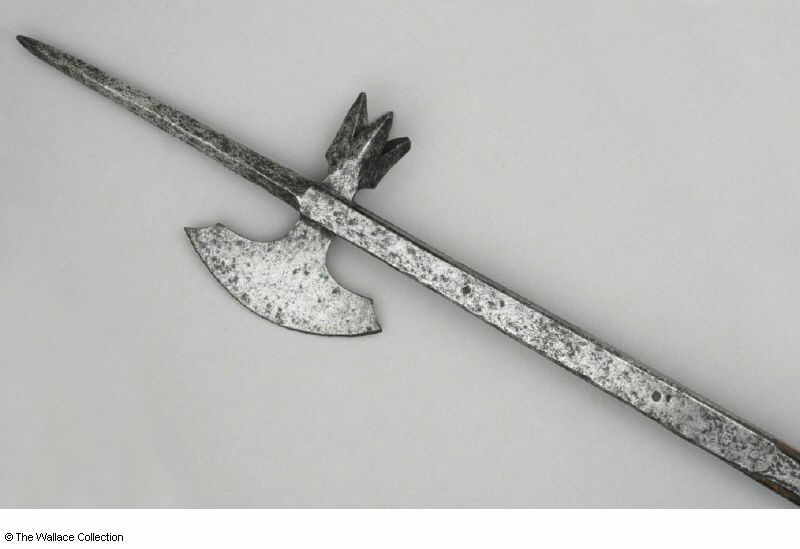 So-called "armour-piercing" blades were designed to slip between plates or bust open mail, not penetrate the plate itself. The reinforced thrusting points we see on some weapons was not to make it easier to penetrate armour but to stop it breaking when incidentally hitting armour or bone. Swords may not be able to do much, but spears/ polearms should be able to do quite a lot, even if it were never the main purpose. The Roman plates also being less thick and of lower quality. Here's Thrand throwing a broad leaf shaped iron age spear against a 15th century 1,6mm cuirass. The penetration seems quite decent. (It's the backside of the cuirass, which is probably closer to the roman breastplate design). The pilum is said to easily able to penetrate shields. Although, those shields were probably of questionable quality? Honestly the penetration seems unlikely to do any real harm. I really don't think anything short of the goedendag or other previously mentioned piece will do what you want. A leaf shaped tip is not shaped to go into armor. A leaf shaped tip is not shaped to go into armor. It did reasonably well. It's not meant to go through armor, which makes me think something that's actually got the right design would do some real damage. I'm grateful for your input. The amount of penetration it had wouldn't do anything to someone even if they were naked under the armor. A light stab that barely goes into the first layer of armor will not do anything. Which is what I saw when I watched the first few throws. Think about actually actually fighting - there's no way that could be effective in any capacity especially considering that a Roman soldier doesn't need to be stabbed through the armor to be put out of action. In this discussion I'm more interested in what actually would have happened, not as much what's actually useful. How well do you think the goedendag design would do? The goedendag probably has the best chance. But as far as I'm aware any "armor piercing" has only been effective in regards to chainmaille or fantasy. What makes you think Roman armor was inferior to later armor? The metallurgy is more sophisticated than found in a lot of late medieval and renaissance munition armor, at least! And the thickness is comparable. Sure, by the late middle ages breastplates are getting thicker than the Romans ever used, but that's the thickest part of any armor--and they're facing couched lances, 2-handed polearms, heavy crossbows, etc., *without* shields. Spears and polearms are different animals! Romans only faced one-handed spears, and yes, they are highly effective and dangerous, but they also used shields as their primary defence. Actual Roman pila went through actual Celtic and Roman shields. Why would any of these be "questionable"? The most famous account is a Celtic attack on Caesar's troops in which the Gauls were packed so tightly their shields overlapped. Pila were piercing *multiple* shields to pin them together in groups. Looks like they worked. As Dan points out, swords and spears were never intended to penetrate armor. The blades are designed to cause bodily trauma. Pila had the most likely design to pierce armor, but they were really meant to counter shields. But a square-section spike should be better than a round one, since the corners of a small square hole are stress points that allow more tearing and cracking. That's why airplane windows have rounded corners. You'd want a three or four sided spike rather. As others have pointed out the tip needs to be strong enough to not bend which is hard with a very pointy circular tip. You basically get four edges to cut/shear open plate as the spike goes in. A circular pointy spike would need to widen the hole as it penetrates thus requiring more energy whereas the hole created by a long four sided spike would require less energy once it had penetrated. There is also the argument that a point with four cutting edges is more efficient at cutting open hard material than an extremely pointy awl. Even the famous ahlspiess doesn't have a circular spike but rather one more like those found on pollaxes. It did reasonably well. It's not meant to go through armor. The range was closer than anyone would have thrown on a battlefield, the target was rigid and unmoving, and the plate was flat rather than being curved like a breastplate. Despite heavy bias against the armour, the spear barely penetrated far enough to scratch the skin of the wearer. You need penetration of at least four inches (some studies say six inches) to have a chance of incapacitating someone in the chest. Even without armour, the chest is the most well-protected part of the human body. It takes a lot less effort to incapacitate someone by hitting them in the leg, foot, face, throat, etc. Nobody deliberately aimed for the chest if the target was wearing armour. Take a look at the analysis of the skeletons from the battle of Wisby. Here we have hundreds of attacks on various skeletons inflicted mainly by two handed polearms - dozens and dozens of wounds to arms, legs and skulls, but not a single injury to the torso or thighs. Thank you. It's cleared up for me. Gotcha. Thanks for correcting me. Fair enough. It's just very relevant for me to know what would happen if some person actually did do it. I think I pretty much got the answer though. Thanks you. The idea is to reduce the drag and actual matter displacement for a given general section volume. The square section is indeed very strong, and has four edges that "cut" the metal, but it also has to actually open up the whole surface, and as the point get deeper and deeper, the actual amount of metal to fold aside increases. That cross cross-sections fix some of these issues. 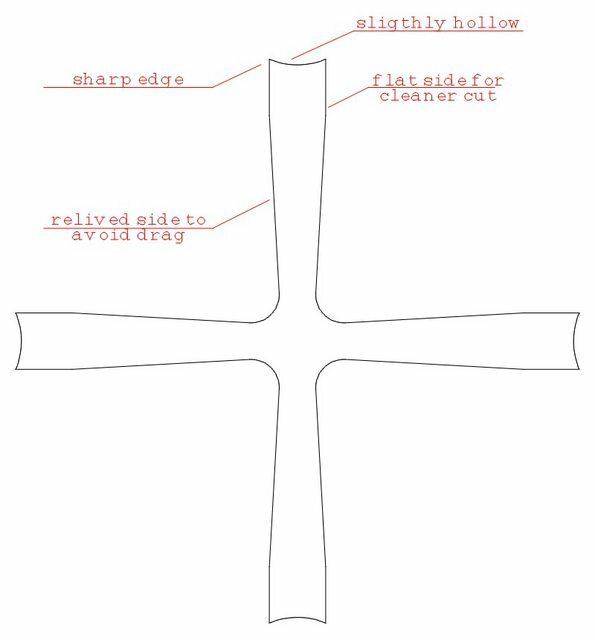 The four arms of the cross have a constant width, and as the point gets deeper, the amount of metal to cut and fold remains constant as well: it merely have to cut a narrow strip of steel. The recessed/relived sides make sure the four "quadrants" remain intact and there is no drag. Since this cross cross-section has lot less matter than a plain square cross-section, it may need to be slightly bigger to have the same stiffness, but no more than 20% or so, and it would be the same weight or less. The lack of drag, and the purpose-designed cutting arms would still produce a significant improvement in penetration. The only limit is you have to use good quality steel, that can hold an edge cutting steel. After a bit of thinking, it appears to me the best cross-section for a dedicated armour-piercing point is not a square or triangle, but rather a sort of cross.. Penetration of metal involves the creation of "petals" of metal that must be pushed aside as the weapon enters until the blade is at its maximum width. Even then there is lateral friction on the blade as it goes through. This is why we see arrows stopped by a target even after the arrowheads has gone through. If we look at an awl that is a cylinder as it penetrates a sheet, it first pushes aside the metal by stretching it away from the impact site in a uniform circle, which is not efficient. Then the dimple of metal fails at the rim and a series of cracks form. The metal between these cracks forms what is called a petal, and it curls away from the weapon as it enters. As might be obvious, the narrower the petal, the easier it is to deform out of the way. If we look at a flat blade, or leaf shaped point, the blade edge immediately forms two cracks in the metal and two broad petals the width of the blade. Energy is spent to propagate the cracks and to displace the broad petals. As the blade goes through the wide flats are subject to friction. Obviously as Dan said above, the blade has to be stiff enough to not deform as it enters or else the friction on the blade becomes very high. The square or triangular awl is the best blend of features. The square awl for example, immediately creates 4 cracks and 4 narrower petals which are easier to move. The flat areas of the blade are smaller in area than the broad blade, even though double the number. A cylinder by the way would have the smallest surface area for friction. SO why don't we see hexagons and octagons that make even narrower petals? Probably they simply act like cylinders. Probably the best shape is a fullered or hollow ground square awl. Not too deep though because the metal will get trapped in the hollows. It has to be rolled away from the flat. Also, any depression in the flat creates larger surface area the more the form diverges from a cylinder.